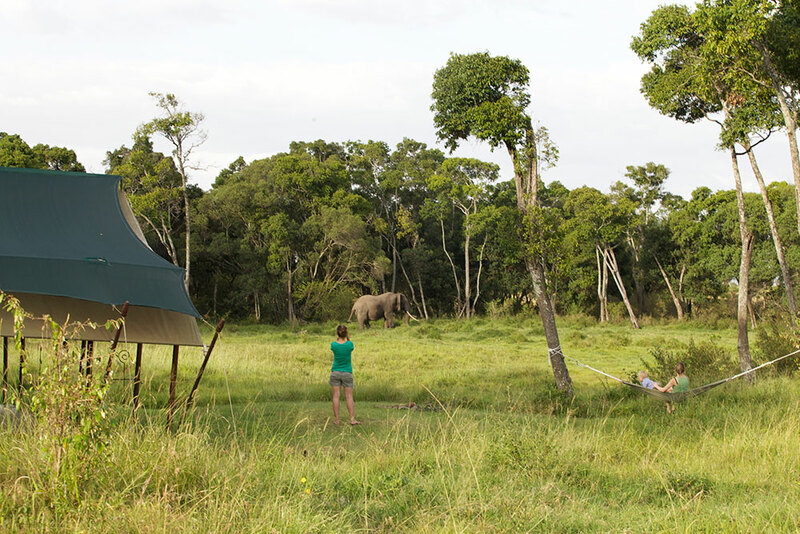 Winner of the Gold Eco-Rating by Ecotourism in Kenya for 2013, Elephant Pepper Camp is a beautiful eco-friendly camp that allows guests to fully immerse themselves in the Maasai Mara without compromising on comfort. The camp’s remote location is not only exclusive and peaceful but allows guests to see the migration and its star-filled night sky uninterrupted. A great location for honeymooners especially, with privacy and romance guaranteed. With resident hippo, lion and hyena wandering through the camp at night, fall asleep to the sounds of the Masai Mara’s rich wildlife population within meters of your tent. The eight luxury tents have been thoroughly refitted and have beautiful, spacious bathrooms, running hot and cold water, dark wood and brass furniture and plenty of light. The shade provided by fig and Elephant Pepper trees keep the tents cool, while the generous spacing of the tents allows guests plenty of privacy. Each tent also has a private terrace and hammock, from which you can enjoy relaxing afternoons watching game wander across the plains. A larger tent that suits those traveling with a family, or those who want a little more space and privacy. Each tent also has space for an extra bed for families with a child under the age of 16, although there are also designated family tents for parents with more than one child. The camp specializes in Northern Italian cuisine blended with local and international dishes, and all food is freshly prepared and excellent (especially the baked goods). Barbecues by the campfire are a regular treat too, and there is also a self-service bar. Tea, coffee and fresh biscuits are waiting when guests wake up and help ease one into the early morning game drives. Night drives have the added comfort of blankets and ponchos for warmth, following fantastic sundowners in the bush. Guides at Elephant Pepper are not only highly knowledgeable but also entertaining and go out of their way to ensure guests see all the wildlife they wish. Cultural tours and birding are also available. Want to see Elephant Pepper Camp as part of a trip? Enquire today to let us help build your holiday.